Now down to business. 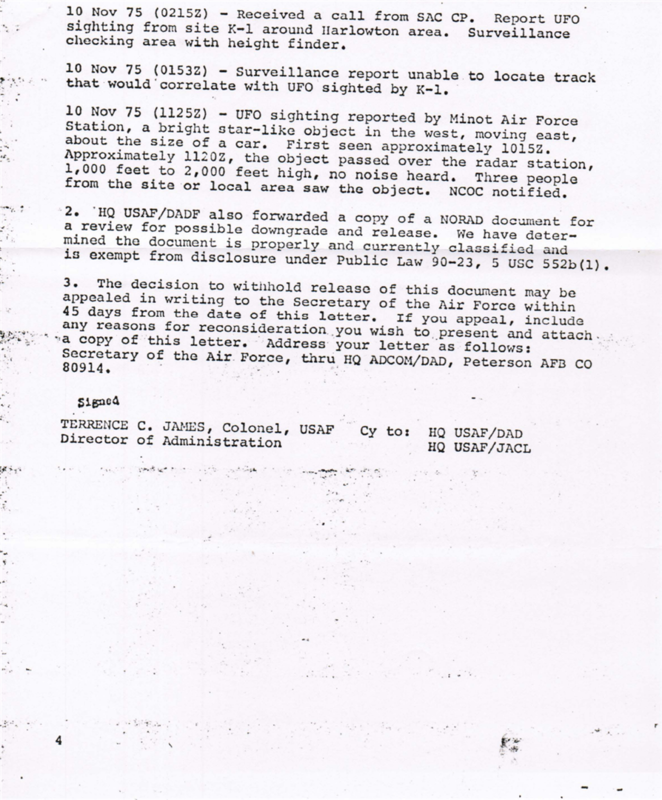 A little known fact concerning the infamous Japan Airlines sighting in 1986 is that NORAD almost definitely played a role in the extraordinary event, completely aside from the FAA and even the USAF. For those that do not know about this case, I will only briefly summarise it. On November 17th, 1986, Japan Airlines (JAL) cargo flight 1628 was flying at nearly 900 kilometres an hour over Alaska. 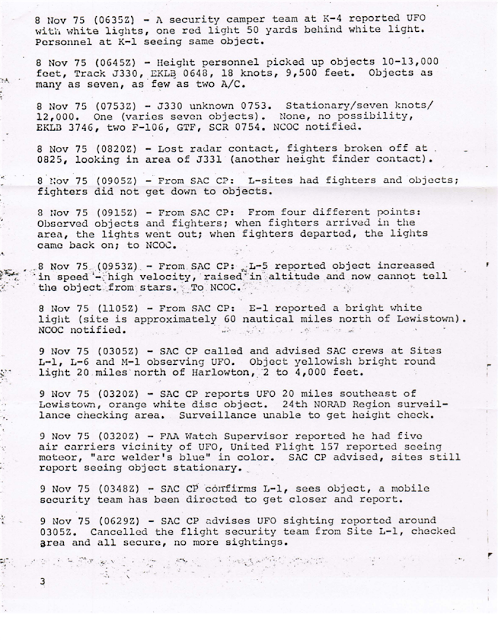 Just after sunset, the three crew witnessed a series of UFO encounters that last for 31 minutes, and, the entire fiasco was watched on both FAA primary radar, and, USAF primary radar. The case made headlines around the world. In 2000, John Callahan, Chief of the FAA’s Accidents, Evaluations and Investigations division confirmed the seriousness of the event, and the involvement of the Central Intelligence Agency and the President’s Scientific Staff. 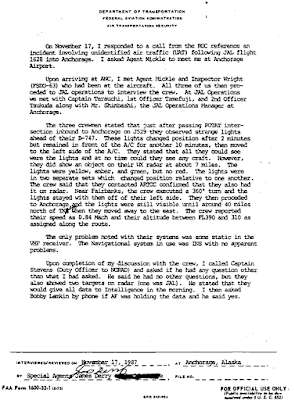 He also came forward with more FAA evidence, on top of the hundreds of pages of official documentation already released. The passage of speech is somewhat broken, but he clearly says “my other radar man here” and “some other equipment”. 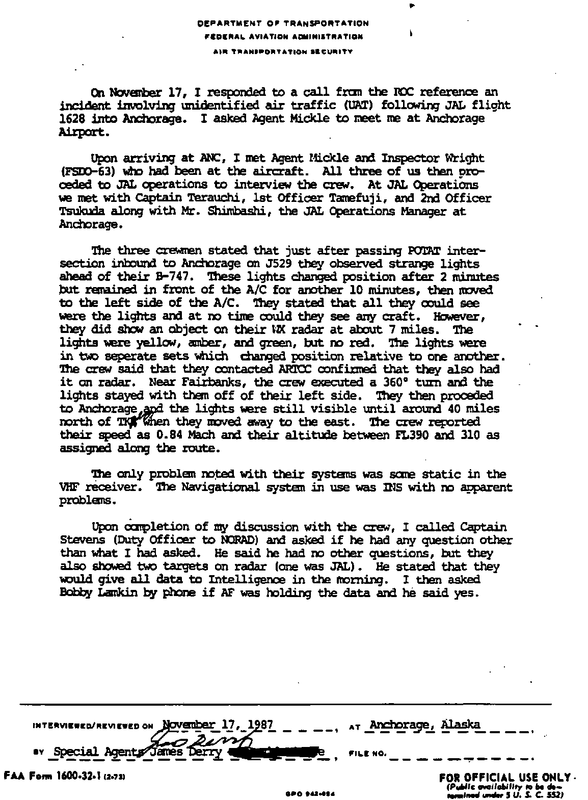 Considering it is a USAF controller who was talking, one can’t help but question who “my other radar man” could be, and, what “other equipment” was “watching” the UFOs around the JAL flight? It turns out it was probably NORAD. 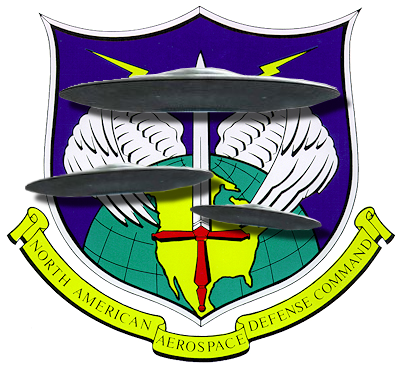 Elmendorf Air Force Base had, in the 1980’s, a more classified system operated by NORAD, which complimented the USAF hardware. The two merged in Year 2000, but, back in 1986, NORAD’s presence wasn’t exactly advertised at the time of the JAL 1628 UFO sightings. 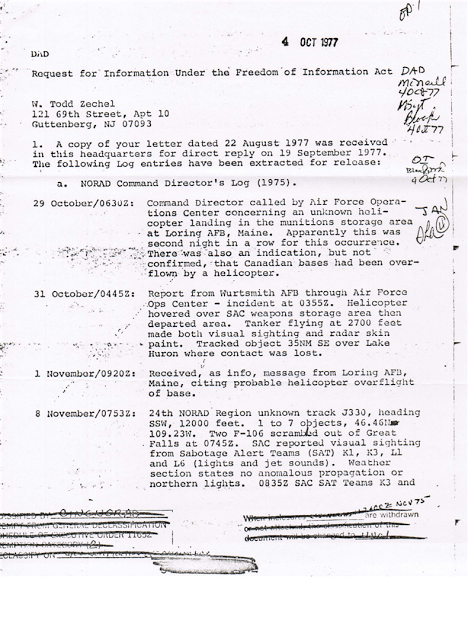 In fact, when one reads that dismal FAA paperwork on the incident, even the USAF’s involvement, let alone NORAD’s, was barely mentioned, despite the fact that they were watching the same thing on their screens, and stating such to the FAA controllers and the JAL pilots. 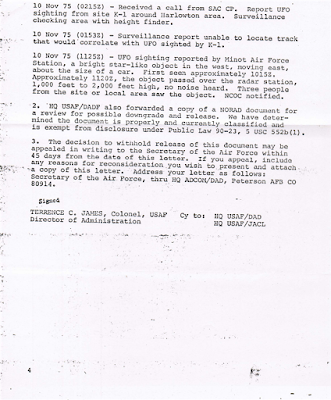 Below is an image of this document. 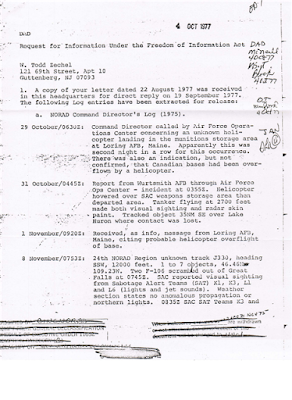 Another incident where NORAD paperwork connects them, very strongly I might add, to serious UFO events, is the extraordinary October-November, 1975 “over flights” of a dozen US military bases by unknown aircraft, variously described as mundane helicopters right through to totally unfamiliar and oddly performing craft that appeared repeatedly on ground-based radar and utterly eluded USAF authorities for weeks. 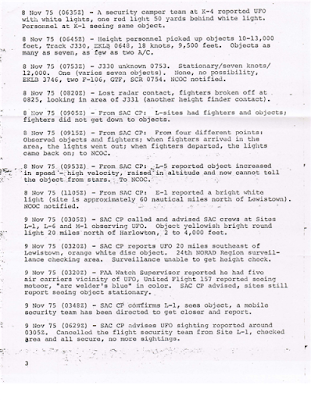 These events were highlighted in Barry Greenwood and Lawrence Fawcett’s game-changing 1984 book Clear Intent, later published with the title UFO Cover Up: What the Government Won’t Say. I will not even attempt here to give an overview of the wave of UFO activity that occurred at that time. What does need to be said though is that hundreds and hundreds of pages of official documents were released from nearly two dozen commands and agencies within the US military throughout 1976 to 1983. Barry Greenwood and Robert Todd accessed most of them, and Barry fondly tells me how stunned he was – time after time – that such raw intelligence and front-line reporting was being furnished to him. These researchers cannot be thanked enough for their work. 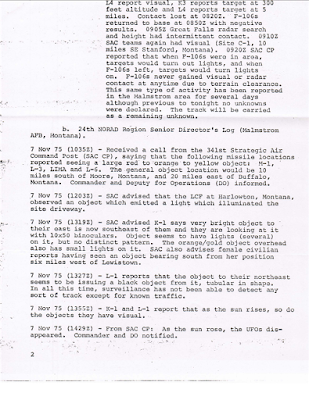 On page 3, the continuing NORAD summaries mention the term “UFO” five times, plus radar tracks of “unknowns”, “objects”, plus the inspection of such events by fighter jets, which met with failure. The page is imaged below. 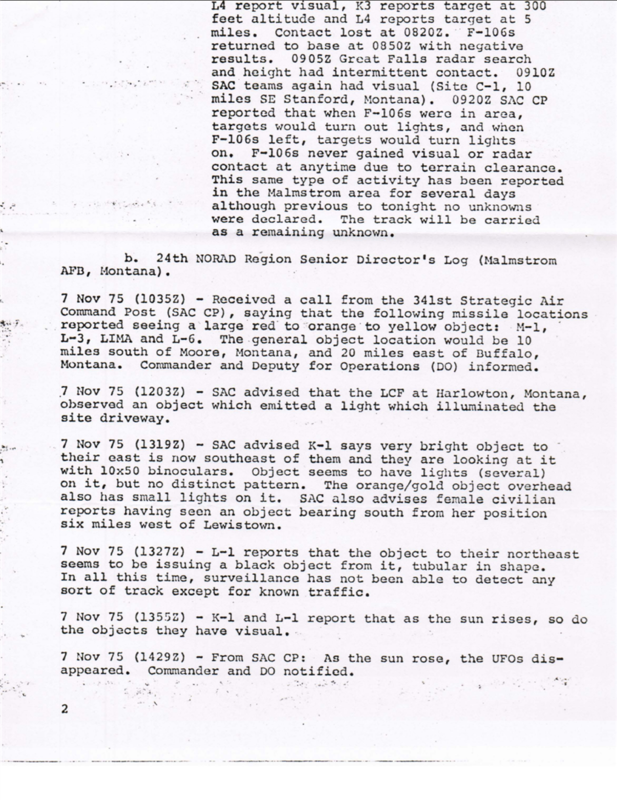 Regardless of who released what, clearly any NORAD Log Extracts that contain the phraseology like “UFOs”, radar tracks of low-flying “unknowns”, “objects” and “unknown helicopters” indeed fall within our area of interest. NORAD, as well as other US military branches, stated that these incidents were “isolated”, but even the most bone-headed skeptic would not accept that. In my next blog post I will be discussing the current and ongoing efforts by myself and UK researcher David Charmichael to get to the bottom of how NORAD currently handles the UFO matter. Stay tuned.